A right tool for effective agent collaboration and team communication that provides team members an opportunity to easily contact via one to one or group chat, with different subject matter experts, to quickly resolve customer’s queries. Both supervisors and agents can create groups, insert quick reply text templates, help articles and also export chat transcripts. A browser and sound notifications are also available on new message receipt. Give your call center users the ability to communicate internally with other agents and supervisors. Agents are arranged according to their teams and an icon represents live agent status. Agent/Agent and Supervisor/Agent Chat: Agents can have one to one conversation with each other and with the supervisor. An alert is shown against the agent name, when a new message arrives. Date/Time for every message is shown along with the message text. Broadcast Chat: Supervisors can broadcast a message based on the filter applied, i.e. online agents, all agents or a specific team. Group Chat: Groups can also be created to initiate a chat between selected agents and supervisors. Group name can be renamed, a new member can be included and a member can also leave the group. Chat History: Chat history for internal chat between team members and also for broadcast is maintained by the gadget. It can be deleted and also exported to a pdf document for a defined period of date and time. Gadget has a user friendly interface that is easy to use and manage. Help Articles: Help articles are there to help agents to quickly extract the required info. New articles can also be added by an agent which will be available for everyone. Quick Text Templates (quick reply): These are short message templates which can be added by any agent and are available for every user of chat gadget. It helps the agent to send pre-written text to others. 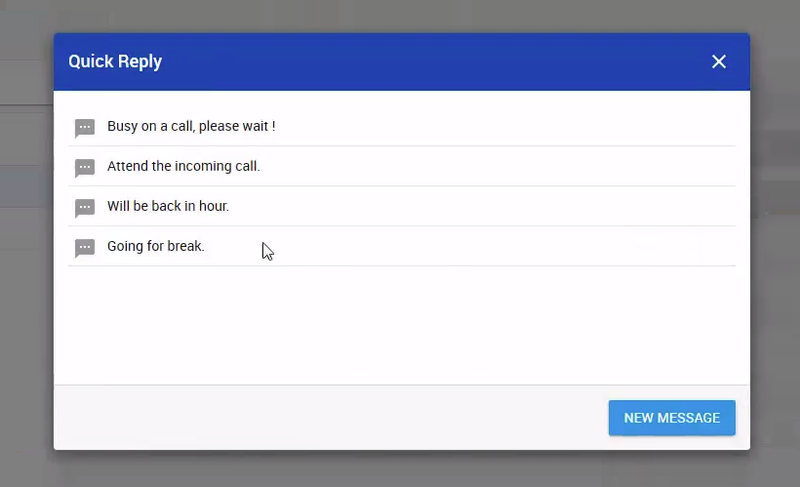 Browser and Sound Notifications: A notification is popped on the bottom-right corner of the screen and a sound is also played for notifying the agent, whenever a new message is received. Recent Tab: A new tab is introduced for recent group conversations. Whenever new chat arrives, conversations (agent or group) is move to the top of the list in recent tab.